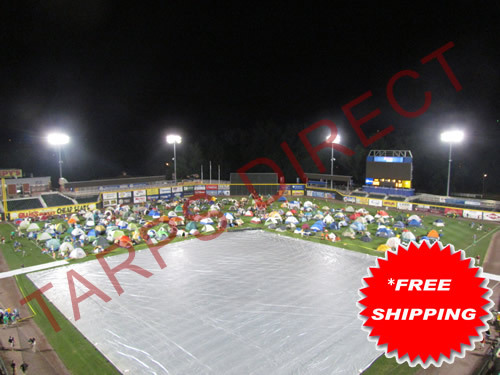 Tarps Direct offers high quality, USA made Field Covers to protect your athletic venue. Available in a wide variety of standard sizes or made special to meet your specific needs, our heavy duty Silver/White tarps when installed will keep rain from over-saturating the playing field or help to maintain your field during times of non-use. 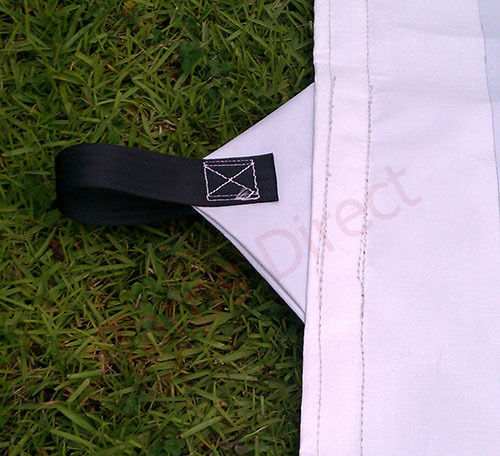 Our Silver/White Field covers are constructed from top quality, durable, UV resistant, 6 ounce, 12 mil polyethylene material that also is waterproof, mildew and tear resistant. Reinforced web handles are provided on all four sides of the tarp spaced evenly every 10-12 feet which allows for ease of use in installing as well as folding the tarp after you are done using. As well, brass grommets every 10-12 feet allow for a secure ground fastening. 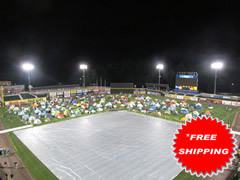 When properly used and stored, Tarps Direct's Field Covers should last for several seasons. The durable polyethylene material can easily be cleaned with soap and water. If you are looking for a more economical option, check out Tarps Direct's Blue or Silver tarps. 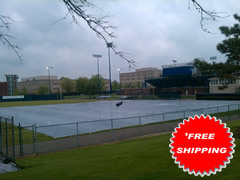 If you are in need of a round mound tarp, check out our Poly Round Tarps. Please call if you need a size that is not listed. Normally ships within 7-10 days. Field covers are listed as a cut size - finish size is up to 1% smaller. 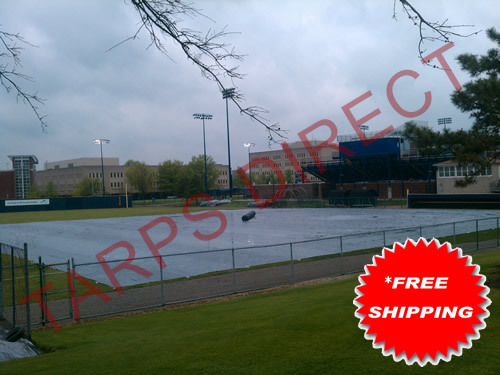 Tarps Direct offers the best quality, durable tarps available to use as Field Covers for baseball, softball or any athletic field that needs protected from the elements or during times of non-use. The Field Cover tarps are waterproof as well as mildew, rot and tear resistant. The UV protection that is added to the baseball/softball Field Cover helps to prevent damage from the sun. Web handles positioned every 10-12 feet around the perimeter of the Athletic Field tarp makes it easier to fold/unfold while the brass grommets located every 10-12 feet allow for secure ground fastening. The 6 ounce weight material is heavy enough to protect your field but light enough to still be handled. The Field Covers are made in the USA. The sizes listed are stock sizes and ready for immediate shipping if the size you need is not listed, we can make custom sizes and normally ship within 7-10 business days. 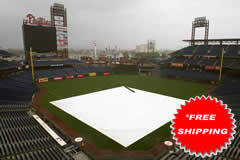 The tarps sizes listed above are popular as baseball field covers, softball field tarps, infield tarps. These Field Covers are suitable for little league, teener league or legion ball fields. Even though they are listed as athletic field tarps, they can be referred to as Mound Covers, Infield Covers, Infield Tarps and Infield Covers.